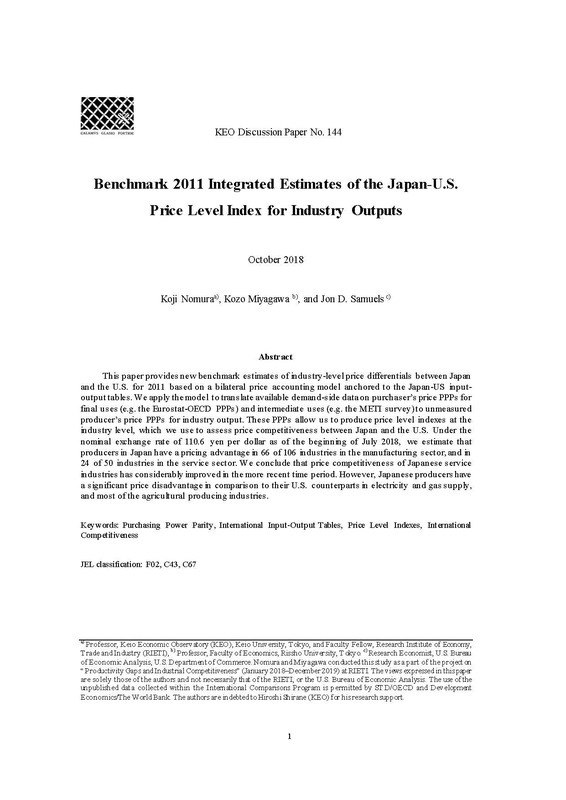 This paper provides new benchmark estimates of industry-level price differentials between Japan and the U.S. for 2011 based on a bilateral price accounting model anchored to the Japan-US input-output tables. We apply the model to translate available demand-side data on purchaser's price PPPs for final uses (e.g. the Eurostat-OECD PPPs) and intermediate uses (e.g. the METI survey) to unmeasured producer's price PPPs for industry output. These PPPs allow us to produce price level indexes at the industry level, which we use to assess price competitiveness between Japan and the U.S. Under the nominal exchange rate of 110.6 yen per dollar as of the beginning of July 2018, we estimate that producers in Japan have a pricing advantage in 66 of 106 industries in the manufacturing sector, and in 24 of 50 industries in the service sector. We conclude that price competitiveness of Japanese service industries has considerably improved in the more recent time period. However, Japanese producers have a significant price disadvantage in comparison to their U.S. counterparts in electricity and gas supply, and most of the agricultural producing industries.